Vocation: part two,What does the Bible say? Christians believe that God calls people to love God and to love our neighbor. To help us understand what that means, Christians look to the Bible for guidance. However, the guidance we receive isn’t a blueprint. It isn’t a plan with 7 steps to success. It’s not a roadmap. Biblical guidance doesn’t assume that one size fits all. The Holy Spirit is more subtle, allowing for varieties of experience, situation, culture and personality. What we find in the Bible are hints, clues, suggestions given to us through the sacred story. There is no career advise in the Bible. There are only examples of how and how not to live. The Bible tells us the stories of people who tried to love God and their neighbor and it tells the story of the God who loved those people no matter what. 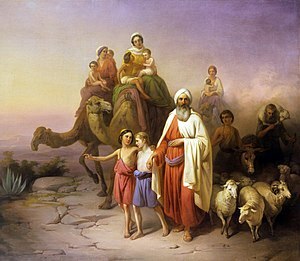 Abraham, for example, is called to “go”- to follow God’s leading to an unnamed land. And if that weren’t enough, Abraham is to be a blessing to “all the other families of the earth”. ( Abraham’s story begins in Genesis 12.) Abraham doesn’t receive a blueprint about where to go and how to be a blessing. He discovers that along the way. If you read Abraham’s story, he made plenty of mistakes. Sometimes he misunderstood what God wanted him to do. Never the less, God doesn’t give up on Abraham and Abraham is remembered for his faithfulness. Even though Abraham was told the “big picture” of children, land and blessing right from the beginning, Abraham didn’t experience all of it in his lifetime. Abraham was part of a larger story. When Jesus is asked which commandment is greatest, he answers, “you shall love the Lord with all your heart, and with all your soul and with all your mind. This is the greatest and first commandment. And a second is like it:’You shall love your neighbor as yourself.’ ” (Matt 22:35-40, Mark 12:28-34, Luke 10:25:28) Jesus’ response comes from Torah (Deut. 6.5 and Leviticus 19:18) Jesus’ response is not new, his response is consistent with the Biblical story found in the Hebrew Bible. His response, which describes the heart of Torah and the Prophets, is what gives Christians our calling. Loving God and neighbor, being a blessing, following where God leads. Today we might call that being a disciple. The twelve disciples, of course, were called to a particular way of life. But their work- making disciples- didn’t for the most part involve changing peoples’ jobs. There were some guidelines for personal conduct, but these could apply to almost any job. The early church certainly believed that certain jobs were inappropriate for Christians, being a soldier, being a prostitute and so on. But outside of those few exceptions, Christians had all sorts of jobs and came from all walks of life. A wide range of work was compatible with being a Christian. There’s not much in the way of career guidance in the Bible. It’s not so much what we do, it is more about the way we do it. That’s where the Biblical stories are so helpful. We read about people who get it right and we read about when those same people get it wrong. We read about bravery (sometimes from quite unexpected people) and we read about cowardness (also from unexpected people). We read about gracious hospitality and we read about fearful exclusion of those who might be different. We read about reconciliation and exclusion. The Bible doesn’t have much to say about jobs and how to choose a career. The Bible does have a lot to say about the way we do our jobs and what meaning we bring to our jobs. Posted in Bible, Christianity, vocation/work. Tagged Abraham, Bible, career, Christian, God, jobs. Next: Next post: Vocation, Part Three: Does God Call Us to Particular Jobs? I appreciate the way you’ve looked at vocation as a way of life – including the way we live at the workplace. I return to the words of the previous post “to love God and to love our neighbor” – and with that in mind, I saw this video before coming here. Wow … what timing. We are called to our own families as well as society. All fascinating thought lines. Good thoughts – especially the question about giving when one’s own well is dry. Granted, everyone’s situation is different; but one can use their heart to allow the eyes to see beyond the obvious. After all, their are countless opportunities for random acts of kindness in front of us each day. Cindy and Frank, Thanks for your comments. I’m glad you two “met” here. The most difficult decisions are between two good choices, don’t you think? How to balance the needs of the world, the needs of our family, and our own needs and interests- that’s a tough balancing act.